MANUFACTURERS' trials of the new Breguet-Wibault Type 670 eighteen-passenger commercial monoplane are almost ДальшеMore>>> completed, and the machine will shortly be presented at Villacoublay for official tests. It is a low-cantilever-winged monoplane of metal construction throughout, and may be regarded as an enlarged and improved development of the Breguet-Wibault Types 282 and 283 triple-engined machines which have met with great success on the European lines of Air France. 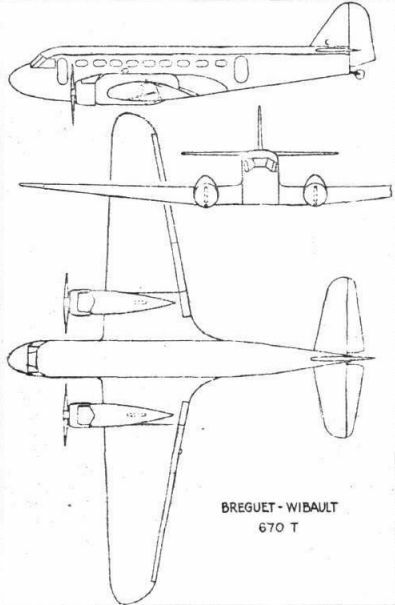 Of typical Wibault form, the cantilever wings are built in three sections - a centre section and two outboard panels. The centre section, which carries the two engine mountings, is of a uniform thickness; the outer panels taper down to a chord of 5 ft. 8 in. at their tips, and their thickness also is much reduced. Duralumin sheet fillets fair the junction of the wings with the fuselage. Structurally the wing is of two-spar type, with spar webs built up of sheet duralumin, and embodying extruded flanges. The covering is of duralumin. Slotted ailerons extend for approximately two-thirds of the wing span, the balance of which is taken up with slotted trailing-edge flaps. In the main the fuselage is of rectangular section, although the nose portion is well rounded. The complete structure, with its covering, is of duralumin. In the nose is the pilot's cockpit, furnished with dual controls, and aft of this is a position for the wireless operator. The cabin has chairs for eighteen passengers, arranged in two rows of nine, each chair being placed beside a window. Soundproofing and ventilation have been carefully studied, and the cabin is by no means cramped, measuring 5 ft. 9 in. high and 5 ft. 6 in. wide An entrance, a lavatory and a baggage hold are located aft of the cabin. Power is furnished by two Gnome-Rhone "Mistral Major" or K 14 two-row fourteen-cylinder radials, geared 3:2 and moderately supercharged to produce 900 h.p each at 4 500 ft. 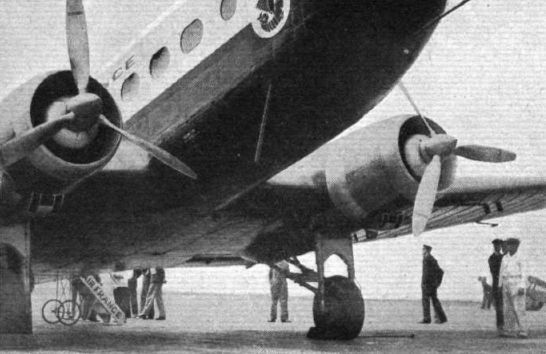 The retractable undercarriage is of Breguet design, with each compression unit composed of a pair of shock-absorbing struts, disposed one on each side of the wheel. Span, 80ft. 9in. (24,86 m); Length, 60ft. 9in. (18,74 m); Height, 23ft. 5in. (7,2 m); Wing area, 846 sq. ft. (78,6 m2) Gross weight, 18,800 lb. (9 000 kg); Range, 625 - 1,250 miles (1000 km - 2000 km); Maximum speed at 5,000ft (1 500 m), 219 m.p.h. (350 km/hr); Speed at 62 1/2 per cent, full power, 186 m.p.h. (238 km/hr). A PRODUCT OF POOLED RESOURCES: The new Breguet-Wibault 670 (two 900 h.p. "Mistral Majors") which has a top speed of 219 m.p.h. and, on 62 1/2 per cent, of its power, carries eighteen passengers at 186 m.p.h. It will shortly be presented for its official test. That the new Breguet-Wibault's maximum speed is 219 m.p.h. can be well believed after a glance at the photograph. Probably the most silent twin-engined transport (from inside) in the world: Air France's new Breguet-Wibault 670 with two 820 h.p. Gnome Rhone K.14S. The cabin plans show the wide gangway and the position of the lavatory and doors.